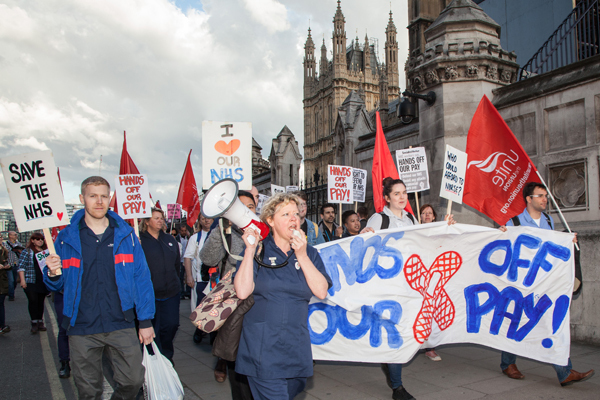 Nurses joined other activists to stage a rally and demonstration outside Guy’s and St Thomas’ NHS Foundation Trust yesterday in protest against plans to scrap unsocial hours payments. L-R: Gavin Cooper Nurse Educator UCH, Janet Maiden - Deputy Sister UCH, Jennifer Morrison - Staff Nurse at Guy's and St Thomas', and organiser Mark Boothroyd. Organiser Mark Boothroyd, a staff nurse at the trust and Unite communications officer, argues that some nurses could lose £6,000 a year if Department of Health (DH) proposals to ditch unsocial hours payments go through.